Take part in an ocean of adventures at this family-friendly celebration! Halloween meets the sea in October during SeaWorld's Halloween Spooktacular. Pumpkin fishes and friendly sea witches stroll the enchanted pathways of Spooktacular Trail, providing a family-friendly trick-or-treat opportunity. Kids are encouraged to wear a costume and Trick-or-Treat at an array of sweet treat stations throughout the park. But whether you wear a costume or not... the day is an ocean full of fun! Sesame Street Countdown to Halloween - Kids and parents will love this live Sesame Street show that features The Count, Elmo, Abby, and the entire Sesame Street crew. You'll be dancing in the aisles and singing along at this interactive activity. Trick-or-Treat Sea Sweets - Costumed little ones can search for hidden "sea" treasures using their Spooktacular maps at more than a dozen different stations. Each station features an array of sweet treats, including a variety of candies and healthier choice options like Pirate's Booty and SunRype Fruit Chews. SeaWorld recommends bringing your own re-usable Trick-or-Treat bag, although there are bags available for purchase at the park. Pets Ahoy Halloween - Enjoy this live animal show and be amazed at what some of your favorite houses pets can do with a little bit of training. Mermaid Grotto - Kids can meet a real-life mermaid at this underwater themed event during Spooktacular. Bubbles and colorful sea creatures come to life each weekend. Halloween Dance Party - Children of all ages will have a blast along with their under-the-sea friends at the Halloween Dance Party. Everyone will sing and dance as bubbles fill the air. SeaWorld Orlando's Halloween Spooktacular is included in a single day's park admission. The 2018 event runs from September 22 to October 28. Visit SeaWorldSpooktacular.com for more details and money-saving opportunities when you purchase tickets in advance. Your child's costume should be suitable for the weather. A child that is too hot or too cold will not have a good time (and, neither will their parents). Most of the treat stations are situated for easiest access from the front of the park, but can be accessed from either end of the trail. You may find Spooktacular Trail least busy just after opening and again just before the area closes. Don't forget your camera! You will want to savor these special memories that are sure to be cherished for a very long time. All guests may wear costumes, however only those under 12 can wear masks or hoods inside the park. Face painting is not permitted on guests unless it was done an artist inside the park. Snuggle into a spooky slumber surrounded by exotic fish, rays and sea dragons inside the floor-to-ceiling aquariums at Manta. Intended for children in grades 1-12 and their families, the all-night program includes a pizza dinner and breakfast. For more information visit www.swbg-adventurecamp.com. 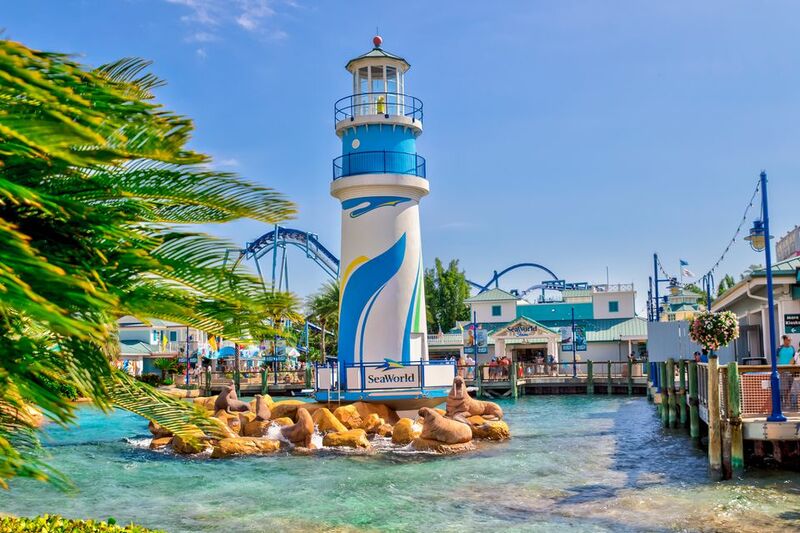 SeaWorld Orlando is located at the intersection of Interstate 4 and FL 528 (the Bee Line Expressway) and is just 10 minutes south of downtown Orlando and 15 minutes from Orlando International Airport.